Stephen Husband’s thirty yard stunner was enough for Forfar Athletic to defeat his former club Dunfermline on Saturday, moving the side to within a point of leaders Stranraer. Seconds before Hubby’s cracker, new father Dale Hilson hit the post with a ferocious effort, with Stuart Malcolm also seeing a header cleared off the line. After last week’s defeat to Airdrie, two changes were made, Husband coming in for the suspended Malin after his appeal was turned down and Hilson returning to take the place of Danny Denholm. The first chance of the game came in the fourteenth minute when Pars left back Alex Whittle fired straight at Rab Douglas. Four minutes later Gavin Swankie saw his effort deflected wide, and from Kader’s corner Stuart Malcolm’s header was cleared off the line by a defender. Faissal El Bakhtaoui wasted arguably Dunfermline’s best chance of the game in the 20th minute, beating a defender before rounding Rab Douglas but instead of cutting the ball back for a teammate to slot home, he greedily fired into the side netting. Just after the half hour mark Malcolm nodded wide from Iain Campbell’s free kick before Swankie dragged Hilson’s lay off wide on the stroke of half time. Swankie was unlucky not to score ninety seconds into the second half, Templeman giving the captain the ball on the edge of the box but his goal bound effort was palmed wide by the impressive Scully. In the 57th minute Templeman set up Dale Hilson and his powerful effort crashed off the post and out to the left wing. Dunfermline’s Andy Geggan dispossessed Swankie after that shot and despite not playing in the same team as Stephen Husband for almost a year, passed straight to the Loons midfielder and he took two touches before unleashing a 30 yard effort into the top corner, giving the keeper no chance. Two minutes later the former Par sent a free kick on the edge of the area inches over while Omar Kader sent his effort over the bar from close range after Templeman’s lay off. Lewis Allan could have scored for Dunfermline in the 69th minute had it not been for a good save by Douglas, the keeper holding Gregor Buchanan’s header from the resulting corner. In the 74th minute Swankie saw another effort parried minutes before former Loon Jim Paterson’s cross found Josh Falkingham but his header from a few yards out went wide when it looked easier to score. Forfar had the last couple of chances late on, with Templeman shooting over and sub Danny Denholm having his shot parried by Scully. The result coupled with Morton’s win against Stranraer means the Loons stay third but are now a point behind the Stair Park men. Forfar Farmington completed their pre-season schedule with a comfortable 3-0 win over Hibernian Development on a chilly Friday night in Edinburgh. A goal in each half from captain Nicola Davidson followed by Holly Napier late on was enough with Hibs providing a tough challenge. Farmington took the lead in the fifth minute, Napier’s corner swept home at the far post by Davidson. Amy Gallacher was unfortunate a minute later, her good run ended with her effort slipping just past the post. In the eleventh minute Davidson almost turned provider, her through ball split the defence for Kayleigh Brough to run onto but despite beating the keeper to the ball she hit the side netting. Jade McLaren nodded wide from Napier’s corner before Hibs started to threaten, having a header parried by Fiona McNicoll and then a shot deflected wide. In the 37th minute another Napier corner found McLaren’s head, this time the header looked to be on target but a defender did well to deny her a goal before clearing the ball. Two minutes after half time Hibs should have netted after their right winger advanced to the byline before sending a cross in that their striker sliced wide while unmarked. Forfar had an almost identical chance in the 53rd minute, Gallacher releasing Napier down the wing and her cross into the box found Johnstone, although the ball looked like it took a bounce as she swung a foot at it and it went over. They had the ball in the net sixty seconds later, Nicola Davidson’s half volley going in despite the Hibs keeper getting a hand to it. Amy Gallacher hit the side netting with Kayleigh Brough’s header looping wide on the hour mark before the Premier League side sent on youngster Beth Shillitto for her first team debut. The Edinburgh side saw a free kick fly inches wide as they looked for a way back into the friendly but Holly Napier killed the game in the 75th minute, latching onto a long ball before lashing home from the edge of the box. McLaren got her head to a Napier corner yet again but sent the effort past the post with thirteen minutes left. In the 85th minute Shillitto could have netted a goal in her first game, weaving her way past a defender although her effort was deflected wide by a defender. With a minute to go Brough outmuscled a defender as she made her way into the box before seeing her shot blocked and Shillitto pounced on the rebound but could only watch as it went agonisingly past the left hand side post. The side now look ahead to next Sunday when they face Hutchison Vale in the first round of the SWPL’s League Cup at Station Park. 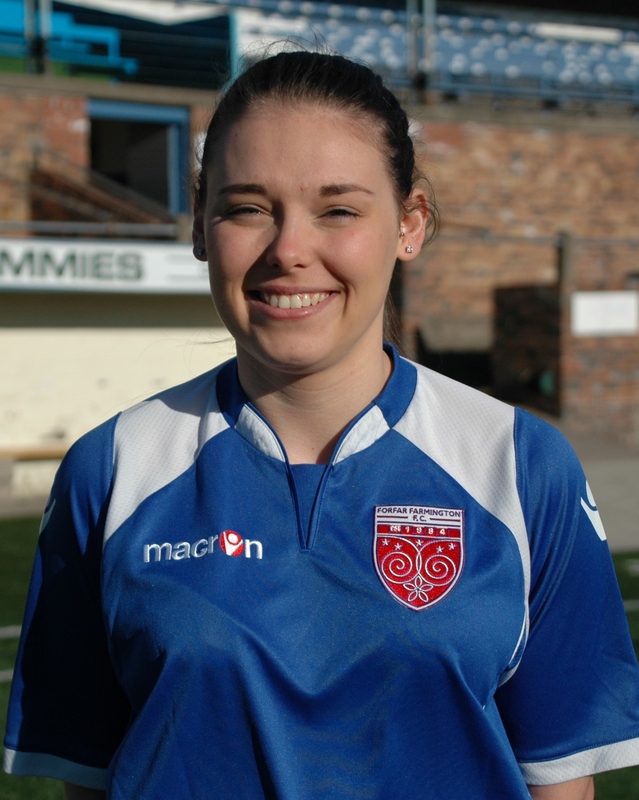 Forfar Farmington right back Sophie Milligan can’t wait for the new season after struggling to break into the side when she joined at the tail end of last year. Milligan came through the ranks at Monifieth Ladies and after a short spell at Dundee United, spent four years at Robert Gordon University, combining playing with her studies. Despite only being at the club for a short amount of time, the right back is impressed by the younger players in the squad: “There is substantial amount of young talent within Forfar Farmington, and stepping up to the mark whilst not looking out of place during a tough last season is really the best experience they could have had. Although it’s a young squad, we have experience in the squad to support the younger ones; and they keep us ‘senior’ players on our toes too. Forfar Athletic returned to winnings ways with a comfortable win over Peterhead at Station Park on Saturday. Chris Templeman and a Gavin Swankie double was enough to defeat ten man Peterhead, with Cameron Kerr grabbing their consolation. The Blue Toon had Rory McAllister sent off for two rather silly incidents in less than three minutes. Just one change was made after last week’s defeat, Templeman coming in for Martyn Fotheringham. After a defensive error, Omar Kader was unlucky not to score inside 90 seconds, sending his effort into Graeme Smith’s arms. This was the only chance in the first twenty five minutes, with the game being end to end without any urgency from either side or any opportunities being created. Stuart Malcolm nodded a Michael Travis free kick past the post before David Cox forced Rab Douglas into action with a free kick that Douglas held. Forfar took the lead in the 32nd minute, Travis set up Templeman although his first shot was parried, Swankie cutting the ball back across goal for Templeman to roll into an empty net. Rory McAllister picked up his first booking in the 37th minute and then received his second two minutes later after the linesman spotted an off the ball incident between the striker and Darren Dods. Six minutes into the second half Swankie put Denholm clean through and his effort forced a great save from Smith, although bizarrely a goal kick was given. Two minutes later Swankie created his own chance, beating two defenders on the left side before curling home from a tight angle for his first goal since November. Iain Campbell and Gavin Malin combined to set up Denholm but he sent the ball over the bar. Peterhead grabbed a goal back from close range in the 59th minute, loanee Cameron Kerr sweeping home Steven Noble’s cross at the far post. Chances became few and far between again until the last ten minutes, Travis and Denholm setting up Templeman but after controlling his shot was touched wide. Swankie made sure of all three points in injury time, Hilson broke after a Peterhead attack failed, sent the ball across to Swankie, he progressed on goal and fired past the keeper to move the Loons above Morton after their game was postponed. Forfar Athletic: Rab Douglas, Michael Travis, Iain Campbell, Stuart Malcolm, Darren Dods, Gavin Malin (Stephen Husband 69), Omar Kader (Dale Hilson 69), Derek Young (James Dale 90), Chris Templeman, Gavin Swankie, Danny Denholm. Holly Napier reckons there is still a lot more to come from Forfar Farmington after they were held to a two all draw by Motherwell in their first pre-season friendly of 2015. Midfielder Lindsey Dunbar’s superb effort from 35 yards out cancelled out the Steelwomen’s first half opener and despite youngster Derrian Gollan putting them ahead, Motherwell equalised again with twenty minutes left. 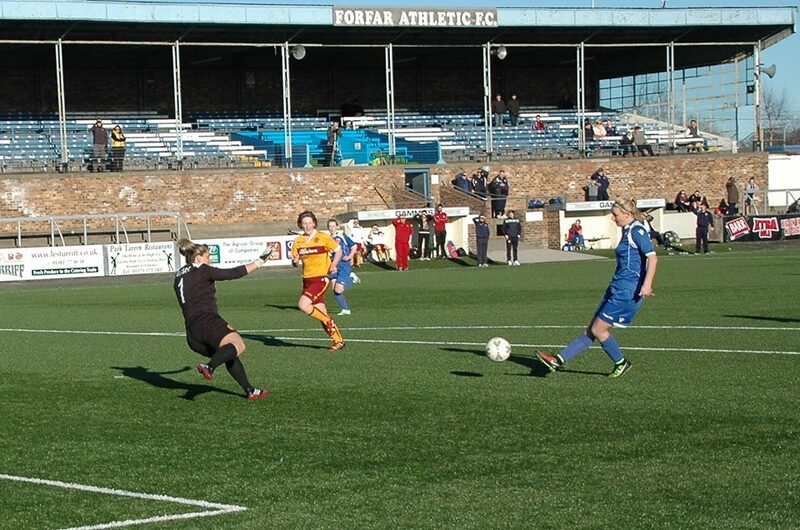 The Forfar side featured Gemma Collier, who had taken a year out from football and Keira Johnstone, making her second appearance since dislocating her knee last March. Farmington had the first chance in the fifth minute, Kayleigh Brough forcing a good save from Linda Gibson. Three minutes later Mandy Burns saw her shot parried and a counter attack ended with Holly Napier laying the ball off for Brough but again her strike was parried before being cleared. The game was a midfield battle, with Motherwell creating more chances as the half progressed, firstly Helen Templeton flashed an effort wide before Pamela Liddell found the sidenetting in the 24th minute. Eight minutes before half time, Motherwell took the lead, Nicole Goodwin punishing poor defending as she lashed home from close range. Six minutes into the second half Lindsey Dunbar scored a fantastic 35 yard volley, pouncing on a poor header to send the ball looping over Gibson. 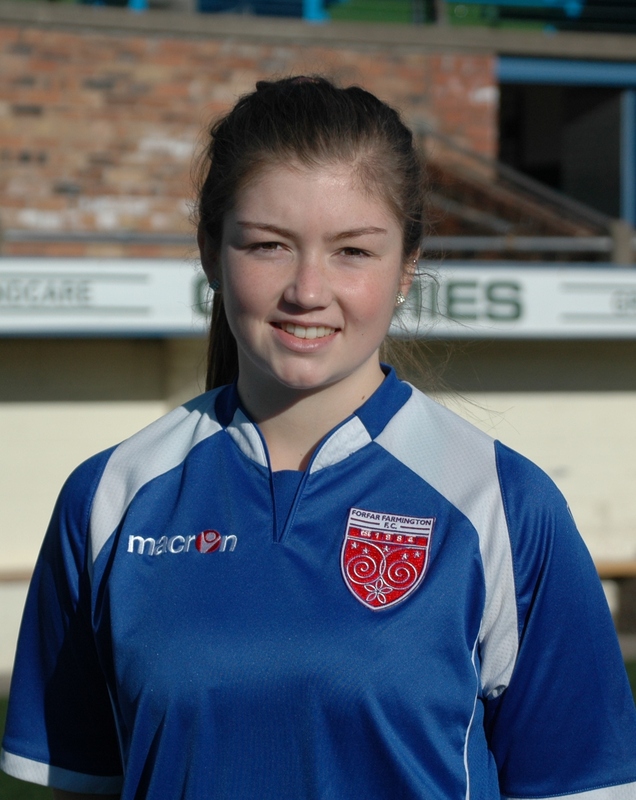 In the 54th minute, 15 year old sub Derrian Gollan scored her first senior goal, latching onto a perfectly timed through ball by Napier, racing clear of a slow defence before slotting home to give Forfar the lead just eight minutes after equalising. The lead lasted all of three minutes, Stacey Cook firing into the top corner for Well. A poor pass back let Gollan in again in the 64th minute but Gibson managed to get a hand to her shot this time. The resultant corner wasn’t cleared properly although Dunbar could only volley into the keeper’s arms. Keira Johnstone set up Napier with four minutes left but her edge of the box chance was smothered easily. 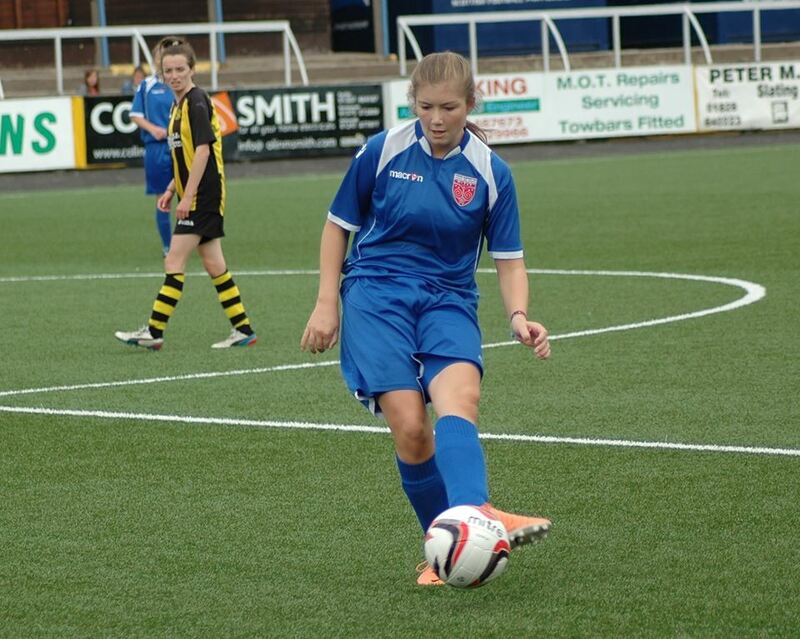 In the 77th minute Jade McLaren set up Dunbar although she could only send her long range effort straight at the keeper. 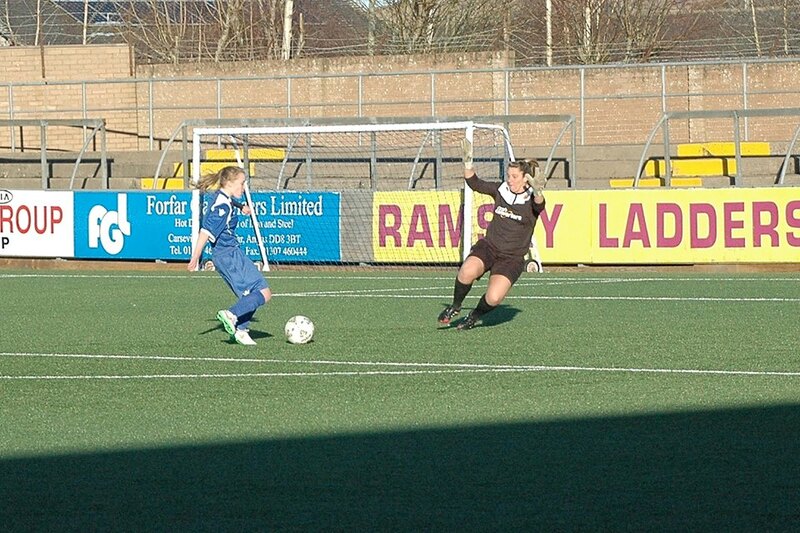 The final chance of the game fell Motherwell’s way, Burns wasting her effort with McNicoll alert to her shot. 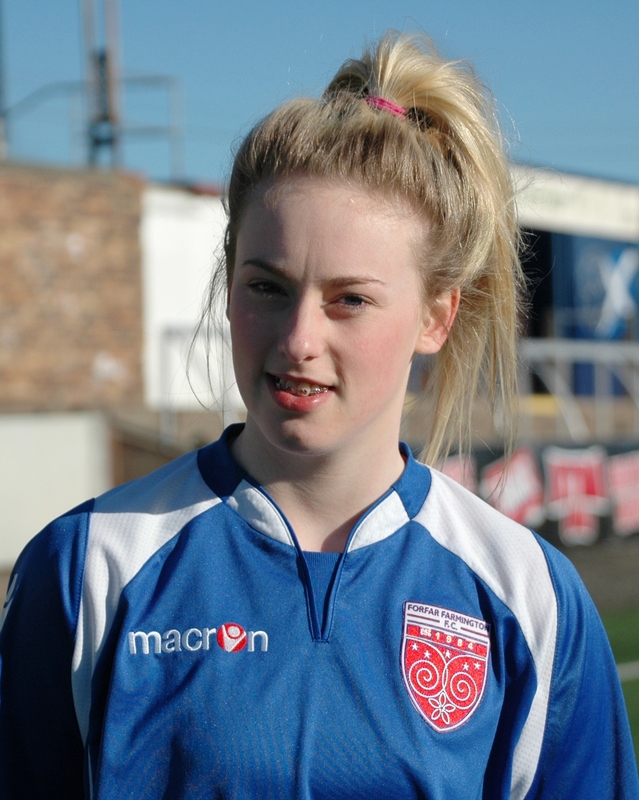 Forfar Farmington midfielder Holly Napier reckons the side will improve on last season, with the experience gained by the younger squad members key to making progress in this year’s Scottish Women’s Premier League. 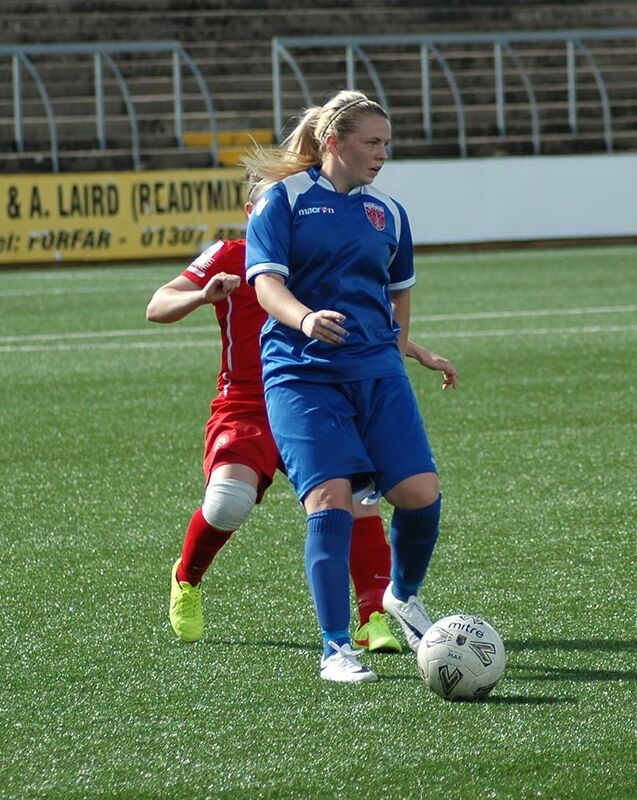 She also believes that Gemma Collier will help add to that, with the defender returning to Forfar after taking a year out from the game to travel. The side’s friendly with Aberdeen on Sunday was cancelled so the pre-season programme begins with a home fixture against 2nd Division side Motherwell this weekend.